1) Identify one genealogist that you would like to meet. The person could be living or deceased. 2) Why do you want to meet with this person? 3) What would you talk about? What questions would you ask this person? 4) Write about your choice on your blog or in Comments to this post. Well, it's my turn. And I didn't have to think too hard! 1] My choice would be Megan Smolenyak Smolenyak. 2] Why? Because she has a reputation for breaking through those brick-walls, and I have one in my family that stumped the family genealogist before me, and which I've only made one step past! So, we've been hitting that brick-wall for well over 30 years! 3] What would we talk about? I think we'd strategize about how to break through that wall completely, and which steps I should next take to see that it happens! What genealogist living or dead would you most like to talk to? Nothing can be more exciting to the Christian who becomes enthused in genealogy than to sit down and begin a genealogical chart on their Savior. It was one of my very first projects! After the genealogy of Jesus is spilled out completely to Abraham, on his earthly father's side in Matthew. And his mother's is regarded in Luke! There was an interesting blog posting in the Chatanoogan yesterday regarding this very subject. You can read it here. Or, if you haven't done this as a practice for yourself yet, may I suggest you get your King James version of the Bible and begin with Matthew Chapter 1 and record the ancestry of Joseph, Jesus' earthly father. Once you have completed that, turn to Luke Chapter 3, to find Mary's father was Heli [please remember that during ancient times, a man would list his son-in-law as his son once his daughter married, which is why we have the two versions of Jesus' ancestry in the Holy Bible. This is a fun exercise for anyone to get into. Looking to make it even more fun? Do a little research, even if just using the internet, and see how much you can find out about each entry! Add that research into your notes. You're going to be amazed at what you can do!!! 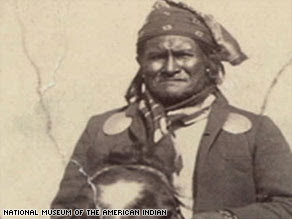 According to the BBC, US officials have moved to block a legal bid by descendants of Apache leader Geronimo to have his remains reburied. Geronimo's relatives say some body parts were stolen almost 100 years ago by members of a society linked to Yale University to keep in their clubhouse. The relatives want to rebury the warrior, who died in 1909, near his birthplace in New Mexico. But the justice department has asked a federal judge to dismiss their lawsuit. The society, known as Skull and Bones, is alleged to have stolen some of Geronimo's remains from a burial plot in Oklahoma in 1918. Government lawyers want to remove the U.S. goverment as a defendant in the case, saying that the government was not involved in the alleged theft of bones. The same lawyers have no objection to the lawsuit's claims against the other defendants: Yale University and the Order of the Skull and Bones. I received Randy Seaver's "GeneaMusing's" blog for Saturday, June 20, 2009, in today's NewsGator feed. That post challenged everyone to go to The Death Clock and determine your date of death! Just go to the website. Input your date of birth, Mode [Normal, Pessimistic, Sadistic, Optimistic], your BMI [ a BMI calculator is located at the bottom of the page] and whether or not you smoke. Being a bit overweight, I was a little leary of doing this.... but..... I went ahead and took the plunge. At first I put in my exact information. My date of death came up January 16, 2034. Next, I adjusted the BMI to where I was at my ideal body weight [IBW] for which I'd have to lose a few pounds. That corrected my date of death to January 16, 2039. So.... I gained 5 years exactly, just by losing weight! In the first scenario I would die at the age of 74. The second, at the age of 79. In both of the above I had input my MODE as Normal. So, for my final calculation, I changed my MODE to Optimistic. Now my new date of death is February 21, 2055!!! Okay, so how do I gain that extra 21 years???? My new life motto is "Que se ra, se ra, whatever will be will be, the future's not ours to see, Que se ra, se ra!" Come on now, Doris Day I ain't!!! Who wants to live to be 95 anyway????? Read my opinion on Randy's challenge at GeneaMusings. Richard Hill searched for 26 years to find his biological parents. Adopted and raised by loving family, he began a slow search, utilizing DNA to locate his biological father. His mother was listed on his original birth record. Richard Hill was too late to be reunited with either his mother or his father. Both had passed away. But he has been united with his numerous half-siblings! Please read the touching story on Michigan Live's website. I have always been interested in Concord Coaches, long considered to be the best stagecoaches ever built. I certainly am not an expert, but have done some reading and have been fortunate enough to see several of these beautiful stagecoaches in various museums. A few weeks ago, I did interview Tom Howard, who IS an expert on Concord Coaches. You can watch and listen to the interview at http://blog.eogn.com/eastmans_online_genealogy/2009/05/video-interview-tom-howard-and-the-concord-coaches.html. You can imagine my surprise today when I walked into a small, privately-owned museum about ten miles from my house and unexpectedly found a Concord Coach on display. This is a real one, manufactured circa 1867. This one is not an immaculate museum display piece; it was a bit dirty and had grease on the axles. The upholstery is just a bit frayed. This is a working coach that is brought out several times a year to participate in parades and other events in the area. Even more interesting to me is that this particular Concord Coach is on loan from the Wayside Inn, a historic restaurant that is about five miles from my home. I never knew there was a Concord Coach in this area! I snapped a few pictures and have posted them here. You can double-click on any of the pictures to see a larger image. This particular coach was manufactured in 1867 by the Abbot-Downing Coach Company and was used to haul passengers, mail, and small freight items in this area. For a while, it was used on the Marlborough to Worcester run along the Boston Post Road. I live a couple of hundred yards from that road today so this coach obviously passed near the house many times. (The house I live in wasn't built until many years later.) The coach remained in service until 1912. In the 1920s, the coach was purchased by Henry Ford and used as the stagecoach to carry passengers, transporting guests of the Wayside Inn located in Sudbury, Massachusetts to and from the railroad station. This is the same Wayside Inn that was popularized by Henry Wadsworth Longfellow when he published his book of poetry, entitled Tales of a Wayside Inn, in 1863. Longfellow visited the Wayside Inn in 1862, when it was called the Howe Tavern. That same book also was the first publication of Longfellow's The Landlord's Tale that contains the immortal words, "listen my children and you shall hear, of the midnight ride of Paul Revere." Henry Ford was the last private owner of the Wayside Inn and he purchased three different Concord Coaches for use at the Inn. One of the coaches was later sold to Concord Group Insurance Company where it is now on display at the company's headquarters in Concord, New Hampshire, only a short distance from the place it was manufactured. That was the first Concord Coach I ever saw as I have visited the Concord Group Insurance offices many times. The second coach still remains at the Wayside Inn except when it is on loan and is the one I saw today. 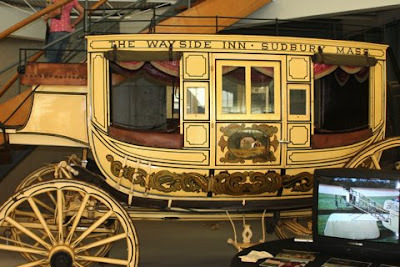 I have not yet discovered the fate of the third Concord Coach purchased by Henry Ford for use at the Wayside Inn. Ford ran the Wayside Inn for a few years and then established the non-profit institution that still operates the Inn and associated museum, watermill, and archives today. The Concord Coach shown in these pictures remains at the Inn except for occasions such as what I visited today when it is "loaned out." Bill West has encouraged genealogy bloggers to write a song about their family, set to a well-known tune. Of my family to show! The American Battle Monuments Commission was established by Congress at the request of General John J. Pershing to honor the accomplishments of the American Armed Forces where they have served since World War I. It is an independent organization operating under the Executive Branch of the U.S. government and is responsible for 24 military cemeteries, including those located overseas. If you are searching for details about military personnel buried overseas, this group can help with a variety of services, including providing a photograph of your relative's grave marker. Check their Web site at http://www.abmc.gov/ for details concerning their role and services. Hear Rep. Randy Forbes' speech to the Speaker of the House, here. It was not broadcast. Why??????? The FamHist blog site has yet another entry on Grave Dowsing. This entry has many links to articles on the subject. I believe you'll find it quite interesting. Dowsing has been used for centuries in this country. Beginning with locating water sources, and even now is used for such, as well as for locating buried electrical wires and telephone cables. I've seen my own Dad use 2 coat hangers he'd straightened out to locate water sources, as well as water leaks during a winter's freeze and pipes froze. I've also seen him use to straight branches from a tree. How it works is beyond scientific explanation. Only that it DOES work! Be sure to read the blog entry, and take the time to go through the many articles mentioned. It's quite fascinating! "An editorial in the New York Times questions the accuracy of the U.S. census to be conducted next year. With little more than six months before the start of the next count, the Census Bureau still doesn’t have a director. And now the bureau’s budget faces a crucial vote by House appropriators who must resist the temptation to shortchange the agency yet again. In April, President Obama finally nominated Robert M. Groves, a top sociologist and survey expert, to lead the bureau, and in mid-May the Senate held Mr. Groves’s confirmation hearing. More than three weeks later, Mr. Groves has yet to be confirmed. The article makes some interesting points but I must add one caveat: the article describes political games being played in Washington. I, too, am concerned about the accuracy of next year's census but one thing I am sure of: if the politicians get involved, the accuracy will be worse than ever! When was the last time a politician worried about the facts? You can read all about the shenanigans at: http://www.nytimes.com/2009/06/09/opinion/09tue2.html. " Over at Family History Thoughts and Links, there's a marvellous story about dowsing. If you're unfamiliar with this method of locating water, electrical lines, etc., you'll definitely want to read this. However, this brings to light a different use for dowsing. That of locating the graves of the dearly departed who have been left unmarked! During the 17th century in England, someone urinated in a jar, added nail clippings, hair and pins, and buried it upside-down in Greenwich, where it was recently unearthed and identified by scientists as being the world's most complete known "witch bottle." Read this fascinating article on MSN. Him Mark Lai, a noted historian of the Chinese American experience,died at his San Francisco home on May 21 after suffering from cancer and its complications. He was 84. For 27 years Avril Grube, 62, did not know where her son was. At 2 years of age, his father, a Hungarian, came for a visit and took the boy out for the day. In fact, the father had kidnapped the boy and moved him to Hungary. Read this touching story of a mother and son reunited on the BBC. The last survivor of the sinking of the Titanic has died aged 97. Millvina Dean was nine weeks old when the liner sank after hitting an iceberg in the early hours of 15 April 1912, on its maiden voyage from Southampton. Her family had been traveling to America, where they hoped to start a new life and open a tobacconist's shop in Kansas. They traveled third class. Miss Dean, who remembered nothing of the fateful journey, died on Sunday at the care home in Hampshire, England where she lived.